Ooohh, that spot really itches! Allergies in your pet can show up as sneezing, coughing or watery eyes, but more often you may see skin irritation. Your pet may scratch or bite its skin or paws, or even lose hair in spots. Don't assume the problem is fleas. Finding relief for your furry friend is one way to show a little love for your best friend. If you have allergies, you know that right now trees especially are causing a pollen problem -it seems to be everywhere. You might be surprised to learn that our pets can suffer from allergies, too. While we may start sneezing, though, our pets probably will react differently. Most of their allergies show up as skin problems. 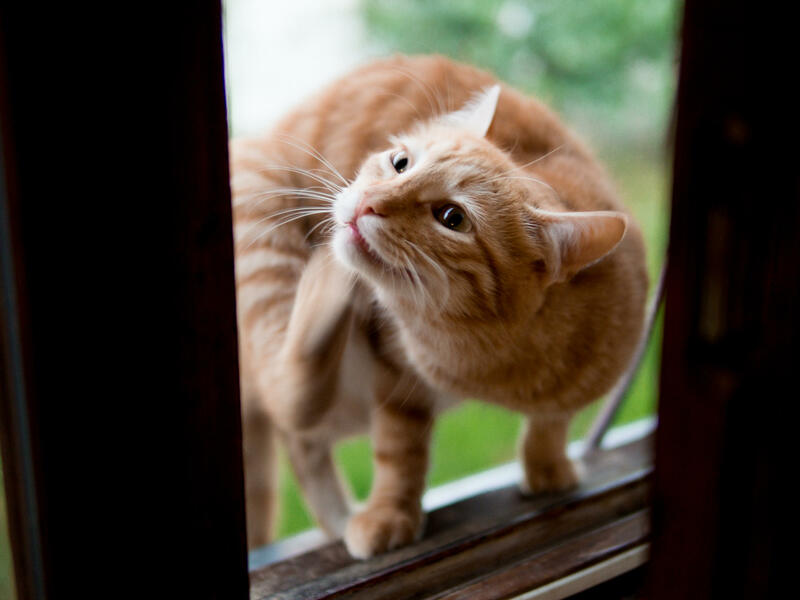 You might see your furry friend scratching a lot, or biting at its paws. That could very well be an allergy. The tricky part is determining what caused your pet’s allergic reaction, so you can figure out how to deal with it. In humans, doctors may prescribe a skin test, in which a number of allergens are applied to the skin to see which (if any) cause an adverse response. Your veterinarian can do the same with a dog or cat by shaving a small area of skin and injecting tiny bits of allergens under the surface. The problem is that those tests can be expensive. The benefit is that once a specific allergen is identified as the culprit, your vet can give your pet allergy shots. If your dog or cat has a seasonal allergy, your vet may suggest a steroid in the form of a pill or a shot. That can be very effective in the short term to help your pet feel better, but steroids are not a long-term solution because of potential side effects with prolonged use. One of the best things you can do for your pet is to keep it clean – that means regular baths - and limiting its exposure by limiting its time outdoors. Ask your vet about using an antihistamine like liquid Benadryl, although you must be careful about possible side effects. An air filter system indoors can help to clean pollen from the air, which could make everyone feel better. So the next time you see your pet scratching or biting at its fur or skin, consider that it may be having an allergic reaction. And just as with humans, allergies are not something that can be cured, but they might be treatable. A little relief can be a very welcome thing for both you and your best friend, when you’re speaking of pets.